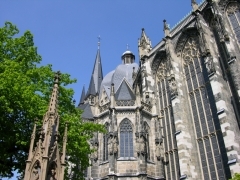 Aachen has historically been a spa city in North Rhine-Westphalia, Germany. Aachen was a favoured residence of Charlemagne, and the place of coronation of the Kings of Germany. 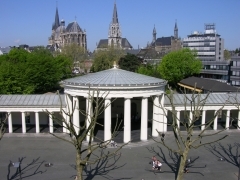 Geographically, Aachen is the westernmost city of Germany, located along its borders with Belgium and the Netherlands, 65 km (40 mi) west of Cologne. RWTH Aachen University, one of Germany's Universities of Excellence, is located in the city. The city of Aachen provides an online portal with comprehensive information on tourism, city information, culture, leisure, economy, technology, and the citizens of Aachen.